We received very good feedback from our customers when we moved from our previous providers to AWS, and that was extremely welcoming because customer service is our top priority. We trust AWS and the innovation it implements every single day. Founded in 2003 and headquartered in Singapore, 2C2P provides payment services for Asian and international businesses, and is the leading payments services provider in Southeast Asia (SEA). 2C2P enables payment acceptance through credit and debit cards, as well as through bank channels such as ATMs, internet banking, and mobile banking. The business also facilitates cash acceptance via payment counters, an important feature in Southeast Asia (SEA), a region characterized by low card penetration. With 2C2P’s comprehensive omnichannel solutions, merchants can now transact with customers using any kind of payment instruments including cash. Since 2003, 2C2P has evolved its infrastructure to support growth and changes to its business, from being an independent software vendor (ISV) to an omnichannel payment service provider. By 2008, 2C2P was running its payment services system in a physical infrastructure in a collocated data center in Asia. However, as more customers started using the system, additional traffic started to strain the infrastructure. “The collocated environment presented its challenges, and as a result we started to experience some disruptions to our services. Service disruptions in our line of work are unacceptable as customer service is a business priority,” says Myo Zaw, chief technology officer at 2C2P. The business also wanted to provide services to regional customers, so it needed to work with suppliers that had infrastructures distributed throughout Southeast Asia and beyond. The business was achieving availability levels of around 99.7 percentequivalent to about 24 hours of downtime per year, attributable to the colocated environment. Both its on-premises Internet Data Center (IDC), as well as its cloud IDC in the US were cited as lacking scalability mechanisms to support 2C2P’s customers' needs. Whenever a client ran a promotion, 2C2P had to schedule technology team members to be on standby in the event that an increase in traffic compromised service levels. Further, procuring new physical servers could take up to a month each time, drastically slowing new product development and testing. By 2009, 2C2P started delivering its services from a hybrid cloud and hosted infrastructure provided by multinational vendors. At the time, its cloud vendors were constrained by their service offerings and security standards. They were unable to support standards mandated by VISA and MasterCard, including public-key cryptography standards (PKCS) devised and published by RSA Security. Moreover, the business wanted to innovate rapidly to win and retain business from customers throughout the region, while securing its systems and data to comply with the Payment Card Industry Data Security Standard (PCI DSS), an information security standard for organizations that handle card processing from providers such as Visa and MasterCard. 2C2P also needed an infrastructure that could scale easily to cater to the needs of its end-users. 2C2P’s internal assessment and research established that Amazon Web Services (AWS) was the best fit for its needs. “AWS has multiple regions in Asia and worldwide, and this allows us to work effectively with our clients in the retail, travel, and tourism sectors. AWS also has the security and third-party certified service provider compliance with PCI DSS that we needed. Most importantly, AWS is rapidly innovating, constantly improving its infrastructure, and expanding their suite of services,” says Zaw. 2C2P started its migration to AWS in 2014, and had four months of intensive AWS training for its Singapore development team, and its Thailand architecture and infrastructure management teams. The migration project was finalized in spring of 2015. “We received very strong support from AWS ASEAN architecture teams in Singapore and Thailand. The team was on hand to respond to our enquiries on how we should deploy our applications, databases, and other systems in AWS,” says Zaw. 2C2P is now running an AWS architecture centralized in an Amazon Virtual Private Cloud (Amazon VPC) in the Amazon Asia-Pacific (Singapore) region, with the Amazon United States West (Oregon) region used for disaster recovery. The Amazon VPC isolates the 2C2P environment from the remainder of the AWS cloud and enables the organization to control which components of its infrastructure are exposed to the Internet, and which components are located in a private subnet. 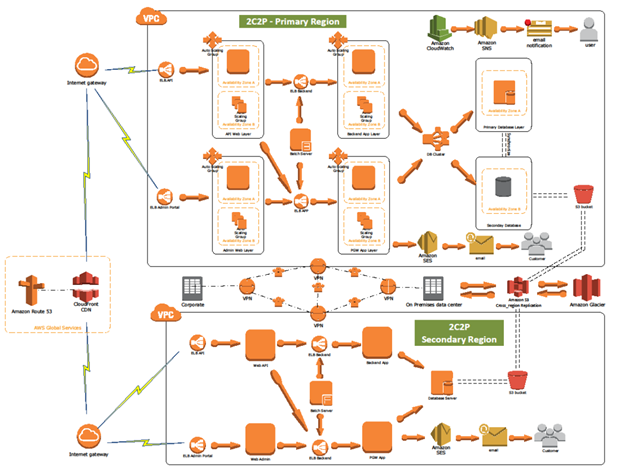 2C2P also uses security groups and network access control lists to help control access to Amazon Elastic Compute Cloud (Amazon EC2) instances that provide compute resources to the payment system, Amazon DynamoDB for log shipping and web-session management, and related systems used to ensure compliance. Elastic Load Balancing distributes traffic across the Amazon EC2 instances to maximize fault tolerance, while Amazon Elastic Block Store (Amazon EBS), which is used for 2C2P data files, as well as application binary files storage, provides persistent block level storage for use with the Amazon EC2 instances. AWS Identity and Access Management (IAM) plays a critical role in securing 2C2P’s infrastructure by allowing the organization to control users’ access to resources within the environment. The AWS environment uses a secure private channel to connect to an on-premises data center run by 2C2P. IAM access via 2FA monitors unsuccessful log-in attempts via AWS CloudTrail, in adherence to PCI DSS requirements. Additionally, 2C2P uses tools from AWS Partners such as Datadog to monitor the infrastructure, and AWS Support, Business-level to assist with technical issues. Zaw says the business is “very satisfied” with the timeliness of responses to its queries. The quality of the services provided by 2C2P is reflected in the caliber of the company’s clients and projects. In May 2015, the business partnered with Myanmar Payment UnionMyanmar’s national payment networkto launch the country’s first electronic bill payment solution, easyBills. 2C2P is also providing online payment solutions for Central Group, Thailand’s largest retailer, and online domestic and international ticket sales for Thailand’s national carrier, Thai Airways International. 2C2P is extremely pleased with the AWS culture of aggressive innovation and high standards of customer service. “We trust AWS and the innovation it implements every day,” says Zaw. “We received very good feedback from our customers when we moved from our previous providers to AWS, and that was extremely welcoming because customer service is our top priority.” This positive feedback includes system availability of 99.999 percent, with tens of thousands of transactions being processed daily in the AWS environment. 2C2P has also been able to automate the scaling out of its AWS infrastructure to support demand peaks during merchant promotions, eliminating the need to have administrators on standby to address service problems that may occur. The business now has three team members in Thailand administering the AWS infrastructure. Zaw believes this is half the number that would have been required in Thailand alone had 2C2P elected to deploy a physical infrastructure, in addition to a team in Singapore. And 2C2P is now able to spin up new development and testing environments in half a day to a day, rather than waiting at least a month to procure new physical servers to support these activities. The value of AWS to 2C2P is poised to rise as the payments business grows, according to ZAW. “Right now, we operate on a B2B2C model, where we are not communicating with end-user customersonly servicing e-commerce merchants and airlines,” Zaw says. “As our product and service capabilities evolve, we will target customers directly and enable our team to provide a better service to customers.” To deliver payment innovation to 2C2P merchants and customers, the business needed an infrastructure that can scale out to support end-users, which is increasing exponentially, year-on-year. “AWS has demonstrated that it can easily support high traffic numbers without compromising performance and availability. We are confident that it can help us provide an excellent user experience,” Zaw says. An Advanced Partner of the AWS Partner Network (APN). Datadog is a monitoring service and data platform for Dev and Ops teams in the cloud age. For more information about how Datadog can help your company build and manage your AWS environment, see Datadog’s listing in the AWS Partner Directory. To learn more about how AWS can help your e-commerce applications, visit our E-commerce Applications details page.